British Isles [Британські острови] – a geographical name used to denote a group of islands in the Atlantic Ocean in north-west Europe, comprising Great Britain, Ireland and over 6,000 other islands. Two sovereign states are located on the British Isles: the United Kingdom of Great Britain and Northern Ireland (UK) and Ireland (or the Republic of Ireland). The British Isles also include the Isle of Man (located between Great Britain and Ireland) and, by tradition, the Channel Islands (Jersey, Guernsey and others), even though the latter are located off the French coast. The Isle of Man and the Channel Islands are self-governing possessions of the British Crown (Crown Dependencies). They are not part of the UK, but the UK government is responsible for their defence and international relations. 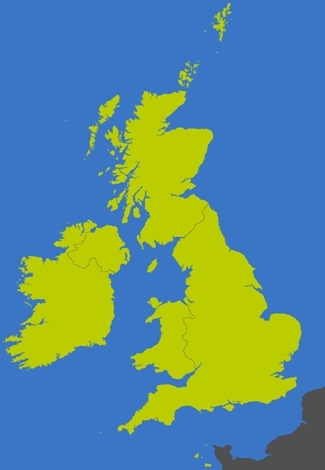 In UK legislation the name ‘British Islands’ (as distinct from ‘British Isles’) officially denotes collectively the UK, the Channel Islands and the Isle of Man. The term ‘British Isles’ is controversial in the Republic of Ireland because of the word ‘British’, and ‘Britain and Ireland’ is often used as an alternative.